These chips or strips are pretty awesome. If you’ve given up on chips because you believe there’s no such thing as a healthy chip, then think again! Thanks to companies like Artisan Tropics, and Jackson’s Honest (who you probably hear me brag a lot about), are making chips healthy again! These chips are cool because they are curled up and sturdy, which makes dipping really easy! 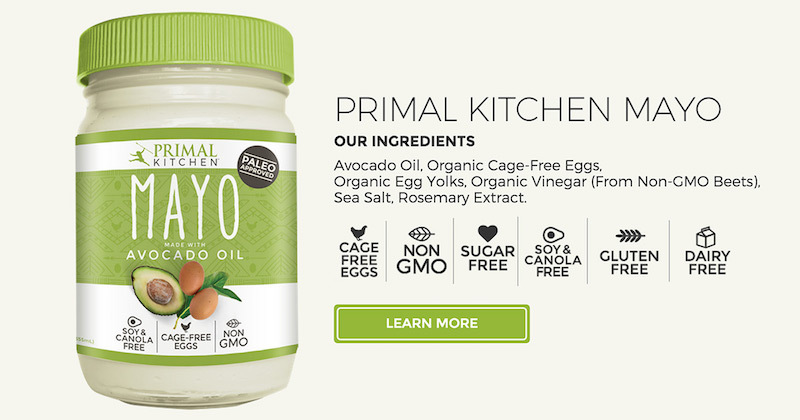 They are made from only 3 ingredients: Sliced Cassava, Sustainable Palm Oil, and Sea Salt. That’s it! Cassava is a South American root vegetable very similar to a potato, and it is often referred to as Yuca. It is also the ingredient which, when dried, turns into tapioca! 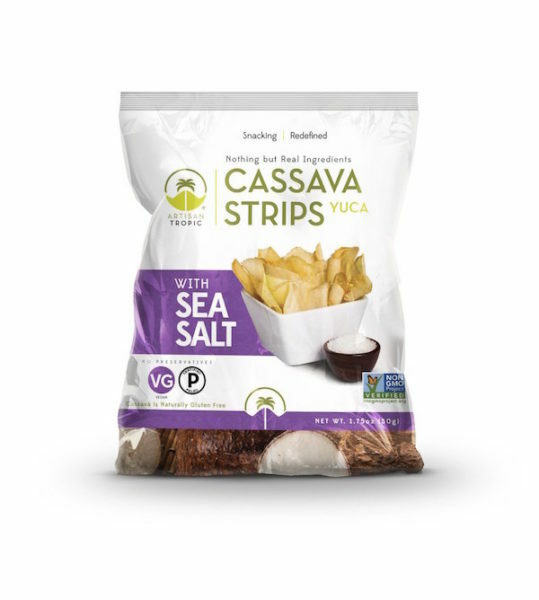 Even though cassava is often compared to a white potato (which is why it makes an awesome chip), it is not a nightshade. Those with inflammatory conditions and/or who are sensitive to nightshades can enjoy these potato-like chips without any concern! And if you haven’t learned about palm oil yet, it is one of the most nutrient-dense, vegan fats we can consume. It is extremely safe and beneficial to our system when we consume pure saturated fats such as unrefined palm oil. Head over to the Artisan Tropics website to buy a case of 16 single-serving bags for $20 with shipping (cheaper than amazon)! And don’t stop there, be sure to check out their sweet and savory plantain strips too! Sign up when prompted and receive 15% off. I must admit I was only hungry when I took a sample of Bubba’s Snack Mix. 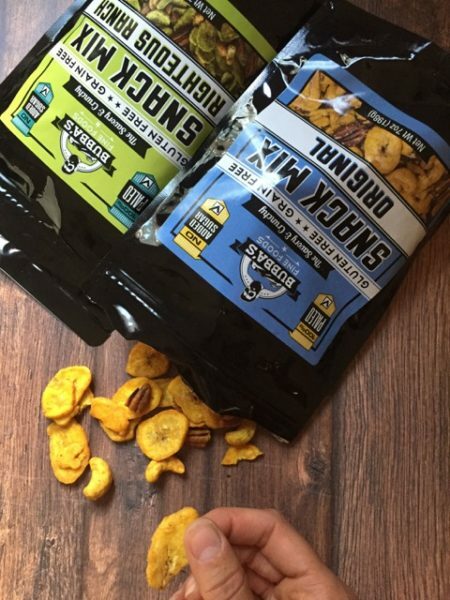 I saw banana chips and immediately assumed I knew what it tasted like. Banana. I was WRONG! These taste nothing like banana! The creator made these chips to fulfill his endless craving for Chex Mix after going gluten-free and grain-free himself. These chips are incredible! Who doesn’t love chex mix? These actually taste like them! I bought a bag of the original and a bag of ranch because they were so dang good. Don’t be scared by the price tag…they are so filling and rich, from the coconut oil and pecans, that you get so many servings per bag (at least 5, maybe more)! Shop here. P.S. Another superior seafood company I have been buying since PFX 2015 is called Safe Catch. They mercury test every tuna they catch, and they only cook the tuna while canning (in its own juices). 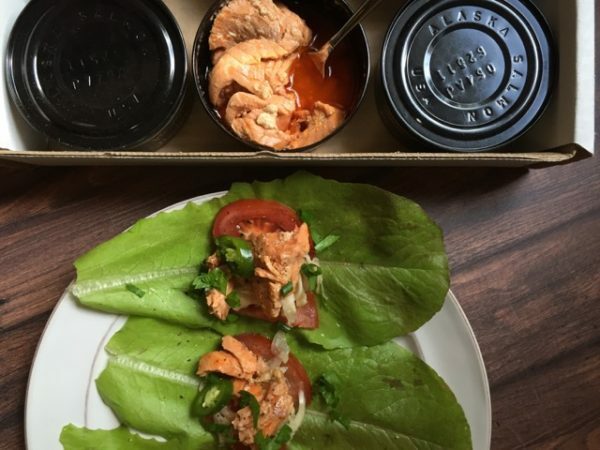 This yields the most delicious, safe, and nutritious canned tuna you can buy. Check out Safe Catch. I have been hooked on these tortillas for over a year now. They are incredible! I really can’t believe how good the texture and flavor is. They were formerly called “Must B Nutty” tortillas, but now they changed the company name to honor their family surname. 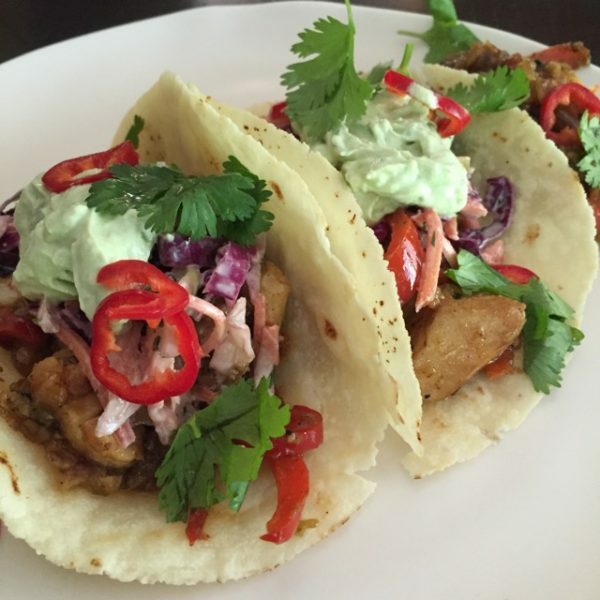 You can now choose from Almond Flour tortillas, or the Coconut Cassava tortilla. I prefer the almond flour texture…it reminds me more of a corn tortilla. The coconut cassava reminds me of a flour tortilla. So that comparison there will help you decide which one you’ll prefer. I always buy these in bulk and freeze them in quantities of 4, divided by wax paper. They thaw in a minute, room temperature, and I can have tacos any time! Do not miss out on these tortillas if you are trying to eat healthier and don’t want to give up tacos. 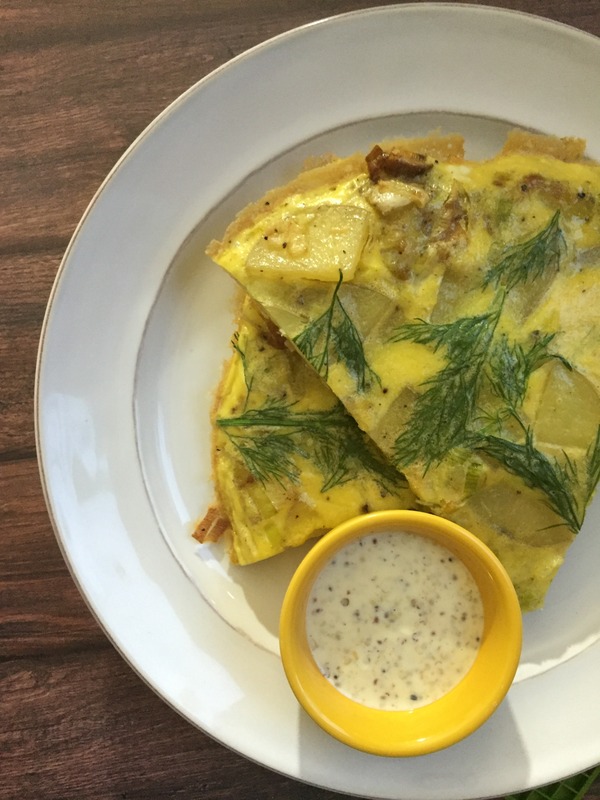 The price might seem steep at $1 a tortilla, but these are a treat that comes without the guilt. P.S. Corn is a grain, difficult to digest, and most American corn is junk (genetically modified, filled with a toxic insecticide, void of nutrients, and cross-bred for a high sugar content). That’s why I switched to these tortillas at home. I don’t miss the corn-based kind one bit! There are a lot of almond flour crackers out there now, but not as clean or tasty as this. 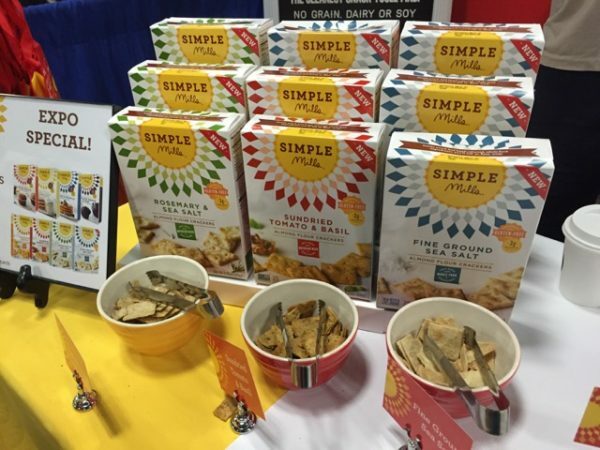 Simple Mills, a Chicago-based company, lives by the motto suggested by their name; simple ingredients in a simple quantity. Each product has only a handful of ingredients, AND they use blanched almond flour…blanching is a good think if we don’t have time to properly soak the almonds. The outer skins are removed during blanching, and it’s those skins that make almonds difficult to digest. You’ll love the oyster cracker/cheeze-it style texture you get in these Simple Mills crackers. I find them in the grocery stores by me in Chicago now, so keep an eye out if you’re in the midwest! 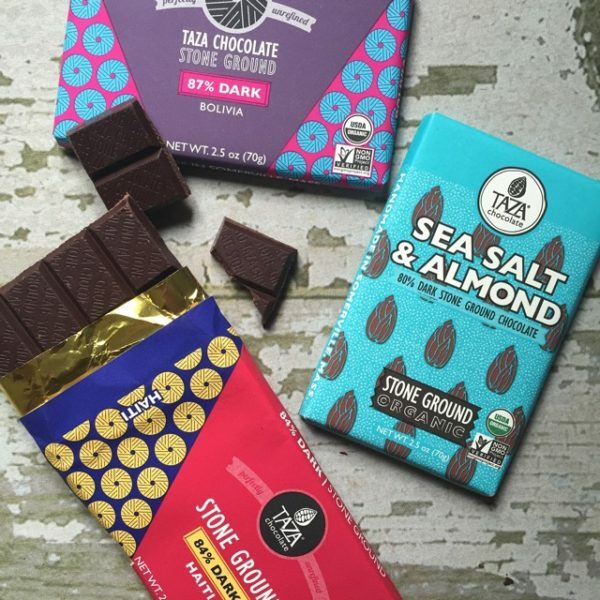 Buy directly from Simple Mills here or order through Thrive Market and save $. Warning…Simple Mills makes all sorts of treats, like pancake mix, cookie mix, and more…all of which are approved by me for a TREAT! They use coconut sugar and coconut nectar and keep the sugar count pretty low (single digits for a realistic serving), which is why I stand by this line of products. These are drastically different than Simple Mills crackers (last post above), so I can’t even compare the two. Jilz crackerz are not something I would typically pick up or buy, because they are made with so many seeds that I’d assume the flavor would be too strong…but I was impressed!!! My friends over at Primal Kitchen are always serving their tuna salad with Jilz Crackerz and recommending them, so I thought I’d give them a try. I was hooked! They are irresistible! 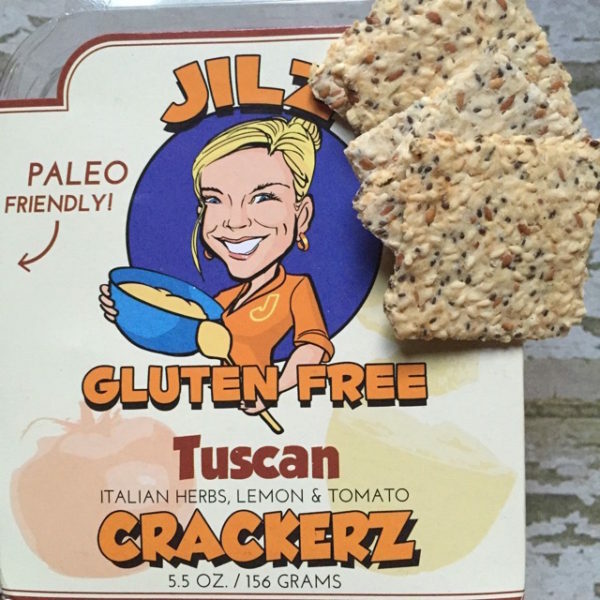 I purchased the Tuscan Herb crackers from Jill’s booth while I was at Paleo f(x), and enjoyed them nearly like I would enjoy a bag of chips. They are neatly stacked in a plastic container so each cracker remains whole, and they are very sturdy and large which makes them great for appetizers! I think everyone should try these crackers! Jill makes her crackers with blanched almond flour, which sealed the deal for me. Like I said earlier, blanched almond meal is the way to go when you don’t have time to properly soak the almonds. Blanching the almonds removes the skin which is the reasons raw almonds can be harsh on our digestion. Add in the rest of the chia, flax, and sesame seeds Jill uses in her crackers and you have a cracker that’s nourishing and complex, leaving you wanting more. You can order them online or use the store locator to find them near you and save on shipping (Mariano’s sells them) . Calling all Slim Jim Fans! These are truly nutritious beef sticks made from grass-fed beef and without preservatives. They use old-fashioned fermentation methods which allow the beef to preserve naturally, and provides us with the benefits of naturally fermented foods. 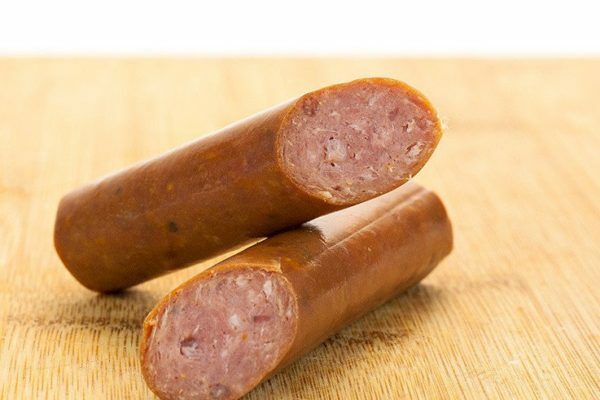 Then they add in familiar flavors resulting in a smoked-summer-sausage stick that’s perfect for snacking, on the go. Take advantage of their subscription and save 30% on every order! Deal. P.S. I only tried the jalapeño and I bought a 10-pack on the spot (the garlic sounds mighty good though). We received our first shipment of the lab tested case of Dry Farm Wines! It took me a while to jump on board, because we usually buy cheap wine (don’t judge)…but I couldn’t hold out any longer! Ever since I’ve cleaned up my lifestyle and eating, I’m more sensitive to certain toxins like alcohol. I want to be able to enjoy myself with company without worrying about a hangover–or worse yet an instant headache while drinking. I heard about this wine club first on a podcast called Fat Burning Man. Amazing information! 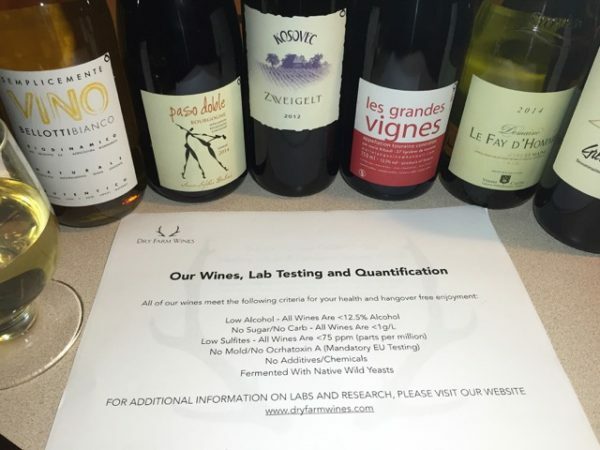 Dry Farm Wines tests all wines for sulfite levels, carbs and sugar, mold toxins, and they have high standards for farming methods and wild yeast fermentation. The founder also boasts about the lower alcohol content you’ll typically find in their wines (although the difference in alcohol content seems marginal to me). I’ve tasted these wines numerous times at both the Bulletproof Conference and Paleo f(x); So, I knew I liked the taste and variety. Thank you to all of the primal leaders for drilling it into my subconscious that I couldn’t live without Dry Farm Wines! That includes Mark Sisson, Dave Asprey, and Abel James (Fat Burning Man). 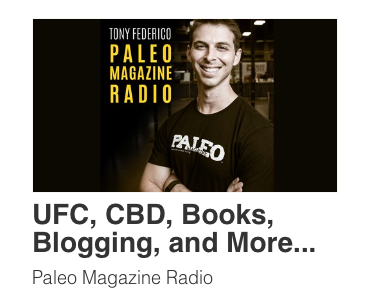 Head over to dryfarmwines.com or seek out the podcast on Fat Burning Man to learn more. I hope you’ll give them a try too! You’ll be amazed after listening to the podcast all the crap that’s in a typical bottle of wine. Yikes! No wonder so many of us react poorly to wine. 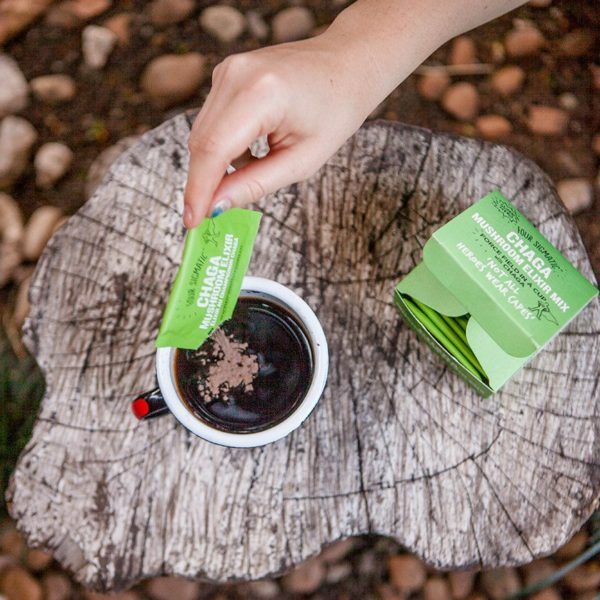 One of my favorite companies, Four Sigmatic, makes convenient mushroom tea packets using medicinal mushrooms and other superfood ingredients. 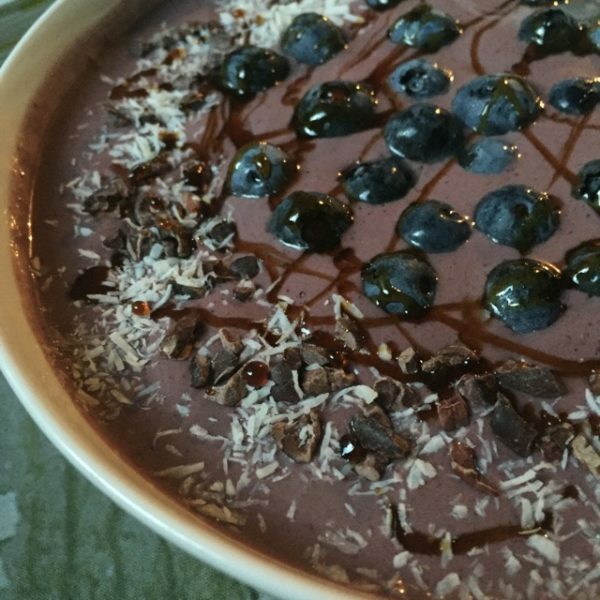 You simply mix the powder with hot water, coffee, or even a smoothie if you’re getting creative. If you haven’t gotten into medicinal mushrooms yet then it’s about that time. Not ready to drink mushroom tea? Try supplements like Reishi or Chaga or, even better are some immunity blends which combine all different varieties. 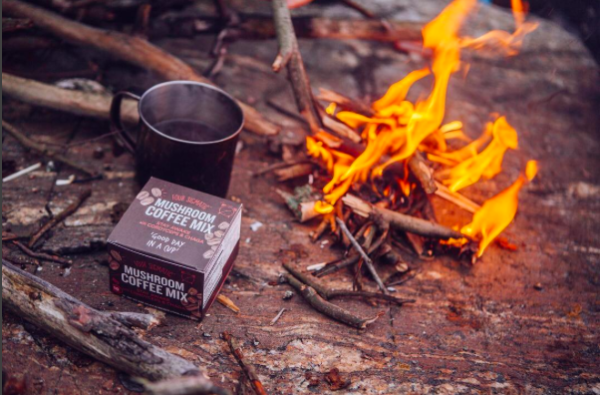 You should also try the tasty, and convenient instant coffee packs, by Four Sigmatic, which combine coffee and mushrooms in a black coffee that needs no doctoring! This is a black coffee I actually enjoy that way. In my house, medicinal mushrooms are a way of life for us now. We take a blended supplement daily (by Host Defense), drink the coffee packs and chaga tea by Four Sigmatic regularly, and a cordyceps supplement for working out. Save big on Four Sigmatic Instant Powders when you shop at Thrive Market. 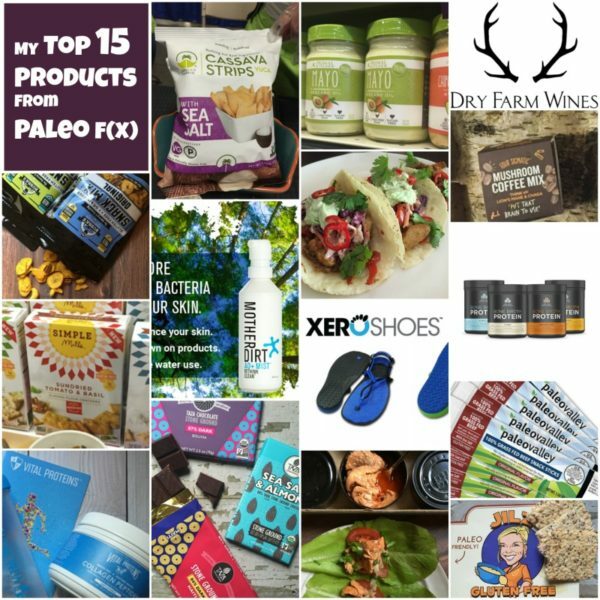 Last month at Paleo f(x), I had the opportunity to meet Katie from Vital Proteins, a Chicago-based company specializing in collagen protein powders and recovery supplements. I have been super into collagen powders for a few years now, always adding them to our coffee, tea, or smoothies. I’ve recommended it to friends and family time and time again, for gut repair and joint pain/injury. After meeting the Vital Proteins team and trying several more of their innovative products, I am a HUGE FAN! The basic collagen powders are tasteless and odorless, easily mixing into cold or hot liquids. This makes them great for everything from soup, coffee, smoothies and even baking. Variety is a smart move, so try all of the different types they have to offer. The reason I suggest that is because different collagen sources/animals contain different types of collagen…with different benefits. Collagen proteins are missing from our modern diets (thanks to modern food processing); and our bones, skin, all connective tissues, gut, and immune system need it desperately, for good health and anti-aging…this is one of the main reasons that bone broth is sweeping the health food world now. Collagen. It’s the most abundant protein in the body. Studies prove that supplementing with collagen will improve our skin, hair, nails, joints, bones, sleep, digestion, and immunity. What are you waiting for? Go and get some! You’ll be amazed at the line of products they offer. 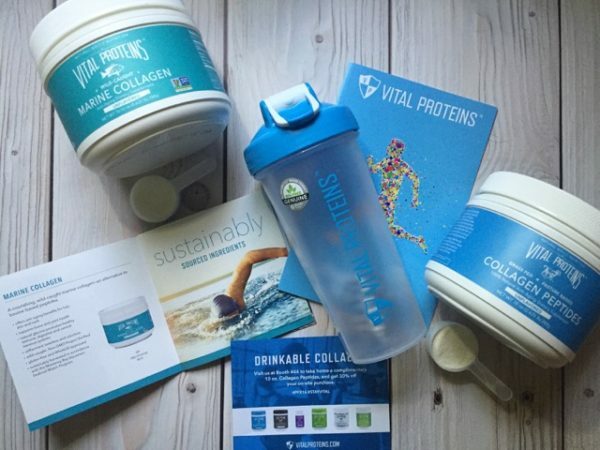 I encourage you to shop around the Vital Proteins site because they offer free shipping on any US order! 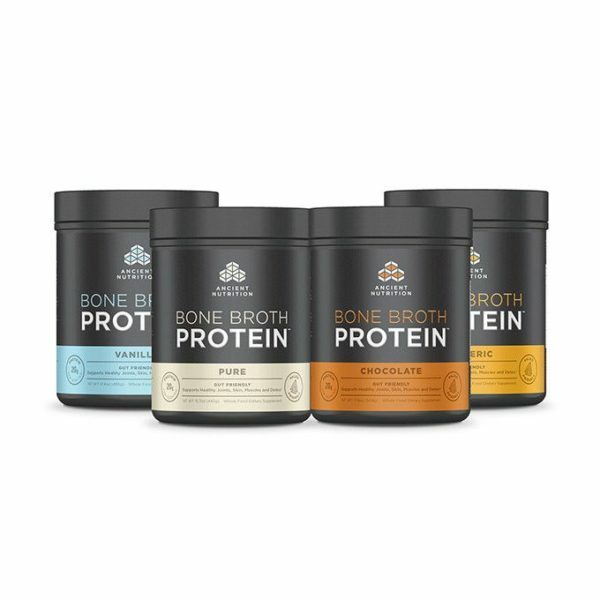 I was skeptical when I saw the name “Bone Broth Protein” because I thought it was the isolated protein…but it’s NOT! It’s actually dehydrated bone broth, and it’s miraculously versatile! It dissolves in liquid like any protein powder, but it comes in all different flavors. I bought the vanilla after tasting it at Paleo f(x) because it’s remarkable how you don’t taste the bone broth! If you have been looking for an alternative protein powder, or wanting to add more bone broth to your diet (but don’t have the time to make the real thing), then this is for you!!! They have 4 flavors, and it’s truly amazing what they’ve done here. So, what’s with bone broth? 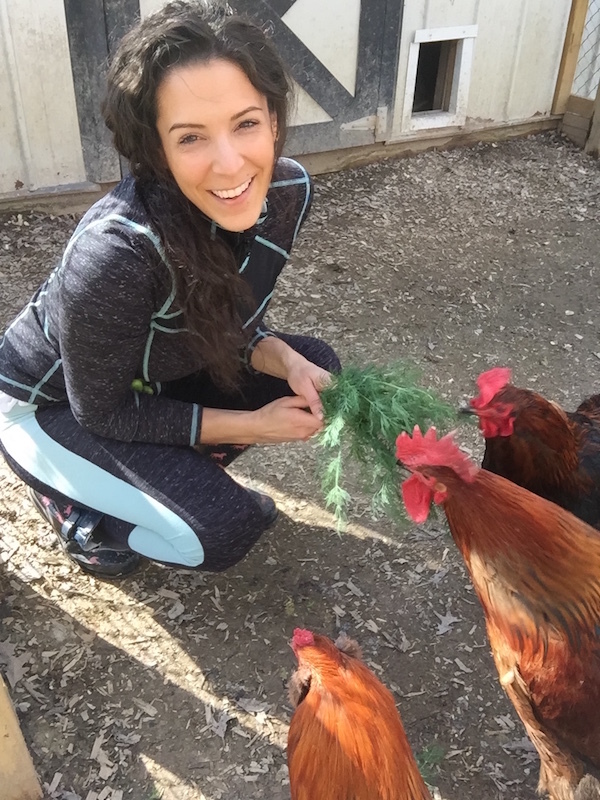 Check out my blog post on HI-VIBE.com where I describe bone broth benefits in detail. 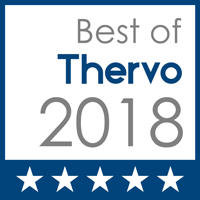 But, in a nutshell, bone broth is an old-fashioned preparation of broth or stock, in which the bones and connective joints are slow simmered for 1-3 days in order to extract the most collagen, minerals, and amino acids from the bones, resulting in a remarkably nutritional substance that is missing in our modern diet. 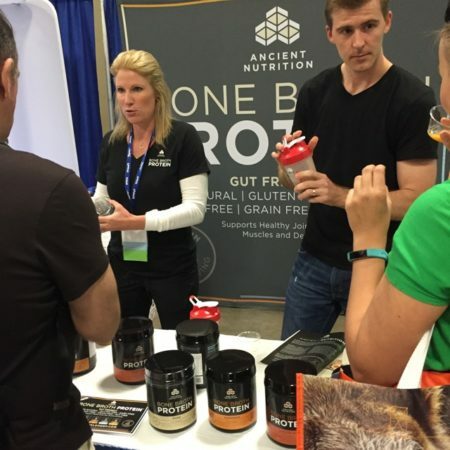 Ancient Nutrition Bone Broth Protein makes is easier than ever to incorporate bone broth in our diet because now we can add it to savory AND sweet foods, in powdered form. 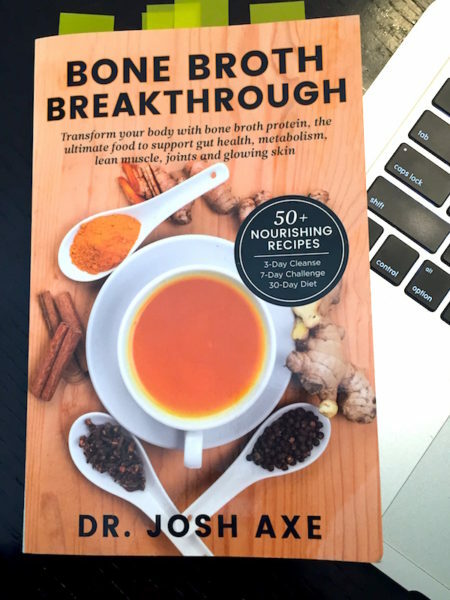 I was lucky enough to get the book called “Bone Broth Breakthrough” by Dr. Josh Axe (one of the Ancient Nutrition founders), which is FULL of thoughtful and creative recipes which include bone broth protein powders. Check it out! Did you know that the bacteria on our skin is just as important as the bacteria in our gut? Since we’ve begun spending less time outdoors, using so many chemical based skin-care products, and spraying chemicals on our soil for farming, we’re no longer exposed to the beneficial bacteria that our skin needs to stay healthy (historically we would get this bacteria from soil). 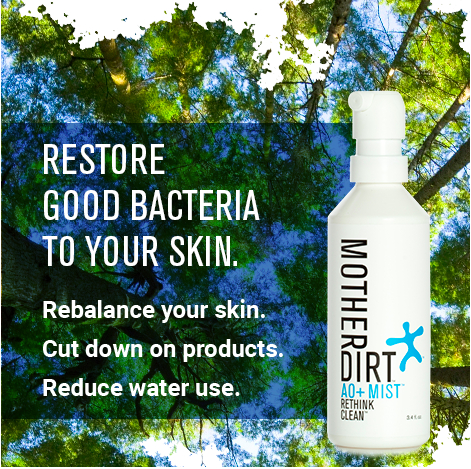 Good news is that now scientists have teamed up with the brand Mother Dirt to bring us a spray bacteria for our skin, restoring the soil-based microorganisms we need for healthy skin and body. It’s probiotics for our skin! They are odorless and easy to use. Check out Mother Dirt’s website for some informative videos and testimonials. “If our genes expect anything from us, it’s that we ought to be barefoot most of the time,” says Mark Sisson (Author of Primal Connection and Primal Blueprint). Our feet were made to have contact with the earth, sending feedback to our brains helping us balance, run, and move gracefully. Since we’ve gone so long thinking shoes are to protect us, we’ve lost touch with the sensation and benefits of barefoot living. This is where minimalist shoes come in. We don’t necessarily have to go walking outside barefoot, but we should be utilizing the intricate muscles and nerves in our feet more often, feeling a connection with the ground. Minimalist shoes help us do that. I fell in love with these lightweight sandals called Xero Shoes. I hope you’ll give them a try! If you already have foot problems, or always wear thick-soled shoes, then you will have to gradually work your way into minimalist shoes. Mark Sisson has written countless articles on this barefoot adaptation, so I encourage you to read on! For all of you that love to know the science, I also love this in-depth article called 15 Health Benefits of Barefoot Running Shoes (According to Science) + 8 Tips for Beginners! I learned a lot from reading this post.